Secretary Butch Abad must go! Full accounting of the funds must be made – promptly! Those who misused DAP must be punished! THERE is still a consolation to the half-baked ruling of the Supreme Court, which, while specifying that certain “acts and practices under the DAP” are unconstitutional, does not categorically declare the entire Disbursement Acceleration Program as, well, unconstitutional. A leading newspaper correctly editorialized that the decision “merely strikes down certain ‘acts and practices under the DAP’ … (but) not the DAP itself … (although) those ‘acts and practices’ … form the very core of the DAP!” Anyway, this supposedly economic stimulus program has at least been formally categorized as an illegal presidential pork barrel similar to its congressional counterpart, the much despised PDAF or Priority Development Assistance Fund that was bilked by Janet Lim-Napoles and her cohorts. Hence, the ruling has removed the DAP’s “legal” justification, forcing the government to prove beyond doubt that the funds were indeed used to “fast-track” the economy or have bankrolled projects that really benefited the masses. The Department of Budget and Management (DBM) later clarified that P114.57 billion was used in 2011 and 2012 from the P136.75 billion available DAP funds. Malacañang also later professed that it “spent properly” 91 percent of the DAP funds, but admitted that it “could not vouch for the remaining 9 percent” or about P12.8 billion that it “allocated for projects identified” by senators and congressmen. Incidentally, any of these amounts given within two years only would make the P10 billion looted by Napoles, et al. over the span of 10 years looked like peanuts. In this regard, as pointed out by a research think tank, the problem with the DAP lies not only on its legality but also on its propriety. It is very plausible that both the executive and legislative DAP funds were used for “patronage purposes” or bestowed by Malacañang to curry favor with the legislators. Indeed, it is even “economically irrational … (as) the supposed stimulus effect is only a cover for various self-serving political agendas.” For instance, there must be something fishy about issuing multibillion-peso DAP funds to members of Congress at the height of the impeachment trial of then Chief Justice Renato Corona, a nemesis of President Aquino. Although Corona deserves to be ousted from office, using public funds to ensure this objective is patently wrong. In reality, little was known about the DAP until Sen. Jinggoy Estrada, in his privilege speech last September, disclosed that senators who voted to impeach Corona each received P50 million “incentive” of “additional PDAF” from the DBM. It was only then that Florencio Abad, DBM secretary, finally identified the funds as the DAP, not PDAF, while denying that these were a form of “bribe.” Interestingly, the DAP was launched through a DBM memo – based on National Budget Circular (NBC) No. 541 – approved by Aquino on October 12, 2011, which authorized the initial release of P72.110 billion, parts of which were intended for “fund requests” of legislators starting November 2011 – or during the time when the Aquino camp was intensely gathering support for the Corona impeachment. The next DAP memo allowing the release of P13.379 billion for “additional projects” was issued on December 21, 2011 – or 10 days after 188 congressmen had impeached Corona. Another DAP memo approving projects worth P32 billion, including P8.3 billion for “various local projects,” was released on June 27, 2012 – or about a month after the impeachment trial, when 20 senators voted to convict Corona. In particular, there are allegations that a total of P6.5 billion DAP funds were used “before, during and after” the said impeachment trial – as much as P5 billion went to the House of Representatives, and P1.5 billion to the Senate. Likewise, coinciding with the May 2013 midterm elections, at least three multibillion-peso DAP releases were approved, as shown in the DBM memorandums on September 5, 2012, December 21, 2012 and “sometime” in May 2013. At first, the Supreme Court ruling was seemingly silent on whether those unconstitutional “acts and practices” – withdrawal of unobligated allotments from implementing agencies in the middle of the fiscal year and redeployment of funds already allocated by Congress in the annual national budget or the General Appropriations Act – are punishable posthaste or will only become a crime after the release of the said high court’s decision. This worried the citizenry that the apparently principal “offenders” – led by Abad, who cunningly crafted these enormous presidential discretionary funds that allegedly reached close to P353 billion from state savings and unprogrammed funds from 2011, when the DAP was started, to 2012; and Aquino himself, who knowingly approved these very potent coffers – might go scot-free. Of course, Aquino, as a President, has immunity from suit while in office; him renouncing it is highly improbable. He also rejected Abad’s purported resignation the other week, which was not irrevocable and already belated. As a portent of things to come, Aquino apologists are floating the idea that his government should invoke the “doctrine of operative fact” or it should not be held liable for implementing a program thought to be legitimate – or done in good faith? – but only later found out by the court as unlawful. Yet even the individual justices’ concurring opinions somehow provided “hints” to the government on how to redeem themselves: That while Aquino “castrated” or “usurped” Congress’s power of the purse, the “noble end” of DAP was recognized, which led the high court to specifically cite the doctrine of operative fact in allowing “noble” DAP projects to stay or could no longer be undone; and that while “(T)he doctrine of operative fact … cannot apply to the authors, proponents and implementors of the DAP,” an exception may be allowed if “there are concrete findings of good faith” among them. Getting this cue, the Aquino camp will therefore insist and highlight the “noble end” of the DAP and its implementation “in good faith.” Thus, one of Aquino’s mouthpieces brazenly stated that no apology is needed over the DAP fiasco because the so-called economic stimulus program was crafted in “good faith.” This evasive pretext must be vigorously questioned by the Filipino people so that truth and justice will prevail. Interestingly, again, Aquino cannot claim ignorance of the law or of not knowing that DAP is illegal and prone to misuse and abuse. On March 4, 2009, when Aquino was still a senator, he filed Senate Bill No. 3121 or “The Budget Impoundment Control Act,” which sought to limit the power of the President in impounding or refusing the release of funds already appropriated by Congress. 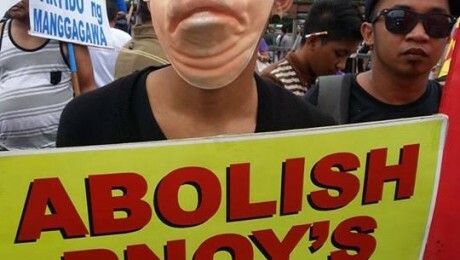 This anti-pork bill supposedly aimed to stop the misuse and abuse of the President’s discretionary funds, which was rampant during the regime of Gloria Macapagal-Arroyo, Aquino’s arch foe. This bill was later consolidated with other similar Senate bills and apparently was not passed. Clearly, SB 3121 of then Senator Noynoy Aquino and the DAP of now President Noynoy Aquino are poles apart and utterly contradictory. In the same vein, Abad, with a topnotch educational background, a lawyer, and a congressman for about 11 years, including chairing the House Appropriations Committee, which handles budget and budget-related legislations, should know full well both the legal foundations and the workings of state funds. This prompted one Supreme Court justice to comment that Abad “may have knowingly” created the unconstitutional DAP. We cannot have the political situation exacerbated further by the intransigence of the President’s apologists and other political interests exploiting the opportunity to destabilize the country’s political institutions. At this stage, Secretary Abad has to resign irrevocably, if only to facilitate an orderly transition into an impartial investigation and accounting by government institutions. We therefore call on social movements, civil society organizations and other vigilant groups to initiate a Citizens’ Audit and investigate where the DAP funds actually went. The Office of the Ombudsman and the Commission on Audit (COA) should work with the Citizens’ Audit to ensure that there is afull and scrupulous audit, – meaning, examining complete and unadulterated list of DAP projects as well as identifying the specific persons (senators, congressmen, etc.) who received the funds. This is no longer just about the intentions of individual people. This is about where our taxes really go – and who should truly enjoy them. Therefore, the Filipino people, including the trade unions, must demand full disclosure of the DAP allocations, whether released to the executive branch or to congressmen and senators or local governments. Either a joint or separate but complementary auditing and investigation of DAP funds and system must be conducted by the COA, Office of the Ombudsman, and an independent body composed of civil society. This must be done judiciously and without delay. All culprits, even top government officials, must be tried – promptly. The trade unions and other mass organizations and the public must intently and consistently guard the entire process of auditing, investigation and trial to ensure that the DAP and similar pork barrels will be abolished, and the guilty will truly be punished.